At "Café Tosca" and our Japanese, Chinese and French restaurants, refined cuisine will delight your palate. 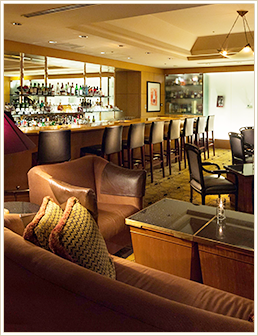 Our staff will also be pleased to serve you drinks at our British-style bar and pastries in the lounge. 2nd Floor Allday Dining "Café Tosca"
* All prices are included 8% consumption tax and 10% service charge. Café Tosca is an open oasis restaurant surrounded by 24 genuine palm trees.Here, gourmets can appreciate a Western cuisine as well as worldwide delicacies, and enjoy watching chefs performing their culinary art in front of their eyes. 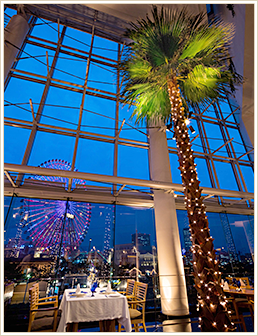 3rd Floor French Cuisine "Queen Alice"
Delight your taste buds at "Queen Alice" restaurant, where Mr. Yutaka Ishinabe, one of Japan's top chefs, prepares exquisite French cuisine using the freshest ingredients. 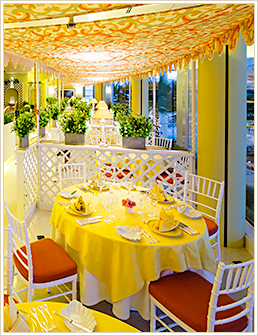 Queen Alice restaurant benefits from a whimsical French garden setting, and the restaurant has private dining rooms for small groups of discerning diners. 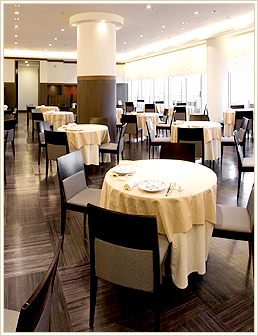 3rd Floor Chinese Cuisine "Turandot"
The Chinese Cuisine with a modern Japanese interior. Chef Wakiya, one of the most celebrated chefs in Japan, presents award-winning Chinese cuisine. 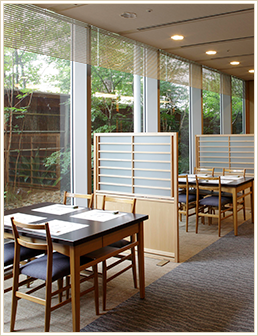 Through panoramic windows, our guests enjoy the verdure of Queen's Park in front, and Yamashita Park and the port from afar to complete the exotic scene. 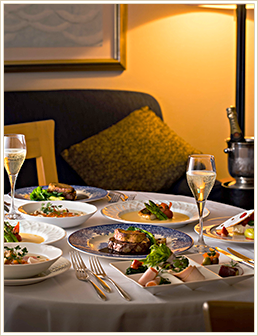 Light meals, snacks, cakes, teas, wine and other beverages are presented with style and grace by the hotel staff. 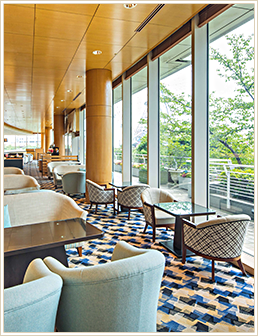 The spirit of good old Yokohama is reflecting in the mood of our bar, In a classic British interior, guests can enjoy beverages ranging from cocktails to whiskies, brandies, wines, premium liquors, legendary drinks and original Jack's cocktails. Fine cigars are also available for cigar lovers.